By: Joseph Jacobs, Emily Solis-Cohen, Jr.
Spanish and Portuguese family of crypto-Jews, some of whom were inquisitors, while others were victims of the Inquisition. Those who made good their escape to the Netherlands, France, and England openly professed Judaism. In the eighteenth and early part of the nineteenth century some went to America, settling in various parts of the West Indies and the United States. 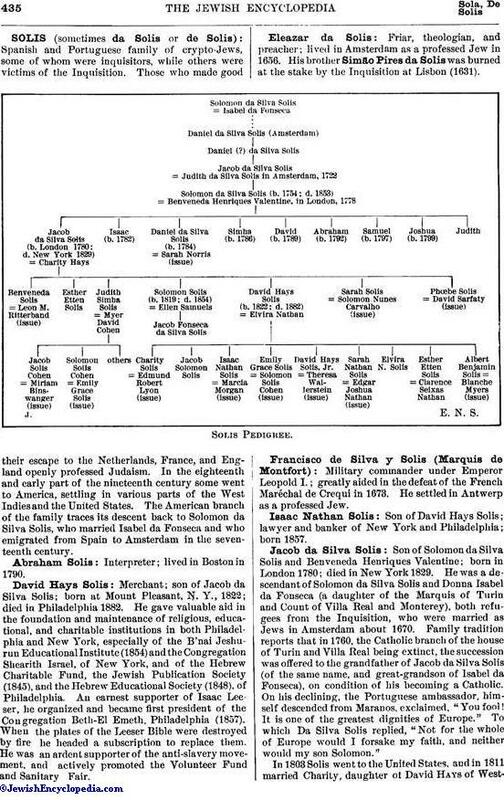 The American branch of the family traces its descent back to Solomon da Silva Solis, who married Isabel da Fonseca and who emigrated from Spain to Amsterdam in the seventeenth century. Interpreter; lived in Boston in 1790. Merchant; son of Jacob da Silva Solis; born at Mount Pleasant, N. Y., 1822; died in Philadelphia 1882. 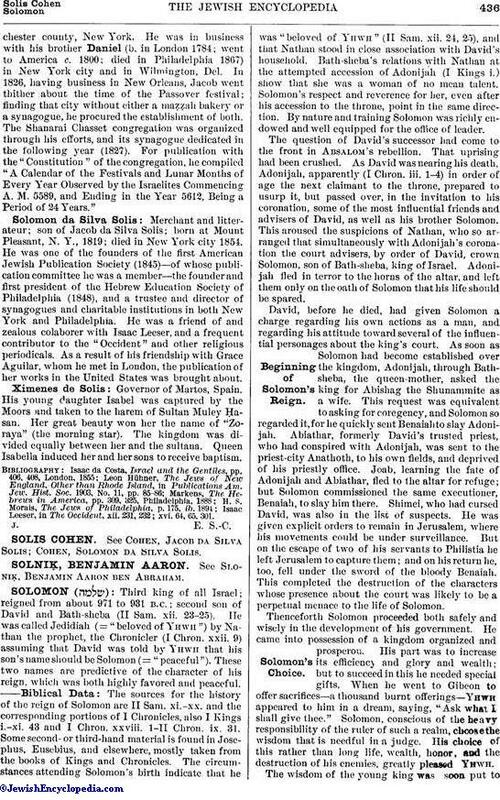 He gave valuable aid in the foundation and maintenance of religious, educational, and charitable institutions in both Philadelphia and New York, especially of the B'nai Jeshurun Educational Institute (1854) and the Congregation Shearith Israel, of New York, and of the Hebrew Charitable Fund, the Jewish Publication Society (1845), and the Hebrew Educational Society (1848), of Philadelphia. An earnest supporter of Isaac Leeser, he organized and became first president of the Congregation Beth-El Emeth, Philadelphia (1857). When the plates of the Leeser Bible were destroyed by fire he headed a subscription to replace them. He was an ardent supporter of the anti-slavery movement, and actively promoted the Volunteer Fund and Sanitary Fair. Friar, theologian, and preacher; lived in Amsterdam as a professed Jew in 1656. His brother Simāo Pires da Solis was burned at the stake by the Inquisition at Lisbon (1631). Military commander under Emperor Leopold I.; greatly aided in the defeat of the French Maréchal de Crequi in 1673. He settled in Antwerp as a professed Jew. Son of David Hays Solis; lawyer and banker of New York and Philadelphia; born 1857. Son of Solomon da Silva Solis and Benveneda Henriques Valentine; born in London 1780; died in New York 1829. 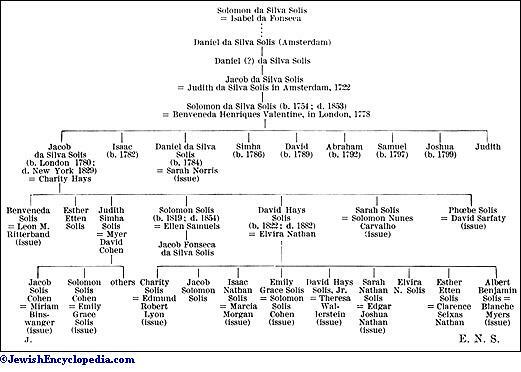 He was a descendant of Solomon da Silva Solis and Donna Isabel da Fonseca (a daughter of the Marquis of Turin and Count of Villa Real and Monterey), both refugees from the Inquisition, who were married as Jews in Amsterdam about 1670. Family tradition reports that in 1760, the Catholic branch of the house of Turin and Villa Real being extinct, the succession was offered to the grandfather of Jacob da Silva Solis (of the same name, and great-grandson of Isabel da Fonseca), on condition of his becoming a Catholic. On his declining, the Portuguese ambassador, himself descended from Maranos, exclaimed, "You fool! It is one of the greatest dignities of Europe." To which Da Silva Solis replied, "Not for the whole of Europe would I forsake my faith, and neither would my son Solomon." In 1803 Solis went to the United States, and in 1811 married Charity, daughter of David Hays of Westchestercounty, New York. He was in business with his brother Daniel (b. in London 1784; went to America c. 1800; died in Philadelphia 1867) in New York city and in Wilmington, Del. In 1826, having business in New Orleans, Jacob went thither about the time of the Passover festival; finding that city without either a maẓẓah bakery or a synagogue, he procured the establishment of both. The Shanarai Chasset congregation was organized through his efforts, and its synagogue dedicated in the following year (1827). For publication with the "Constitution" of the congregation, he compiled "A Calendar of the Festivals and Lunar Months of Every Year Observed by the Israelites Commencing A. M. 5589, and Ending in the Year 5612, Being a Period of 24 Years." Merchant and litterateur; son of Jacob da Silva Solis; born at Mount Pleasant, N. Y., 1819; died in New York city 1854. He was one of the founders of the first American Jewish Publication Society (1845)—of whose publication committee he was a member—the founder and first president of the Hebrew Education Society of Philadelphia (1848), and a trustee and director of synagogues and charitable institutions in both New York and Philadelphia. He was a friend of and zealous colaborer with Isaac Leeser, and a frequent contributor to the "Occident" and other religious periodicals. As a result of his friendship with Grace Aguilar, whom he met in London, the publication of her works in the United States was brought about. Governor of Martos, Spain. His young daughter Isabel was captured by the Moors and taken to the harem of Sultan Muley Ḥasan. Her great beauty won her the name of "Zoraya" (the morning star). The kingdom was divided equally between her and the sultana. Queen Isabella induced her and her sons to receive baptism. Isaac Leeser, in The Occident, xii. 231, 232; xvi. 64, 65, 301.